Shri Guru Ravidass Ji was born into a time in which severe discrimination based on caste existed and which was actively encouraged by those who stood to gain most from it, all of the so called higher castes. The signs of his Divinity showed from an early age. At birth He refused to take milk from his mother for 3 days and it was only at the intervention of the Divine, that he consented and drank his mothers milk. In common with other Divine beings in history He showed a veracious appetite for knowledge at an early age and seemed to already possess the knowledge being offered to him. His grasp of religious and other matters was keen, incisive and ahead of others in his age group and beyond. Details of some of these are set out in pages on this site. We are happy to receive visits from fellow followers in other countries and cities and actively encourage all who wish to propragate the teachings of Shri Guru Ravidass Ji Maharaj. According to those who propagate it, caste is determined by birth and can never be changed. Uniquely in the annals of prejudice, it hamstrings the individual’s ‘upward mobility’ from birth to rebirth. Dalits are people who are seen as being outside of the 4 castes and are regarded as so inferior as to be ‘Untouchable’. This is used to justify the discrimination that they face and consign them to only the most menial and poorly paid of occupations. 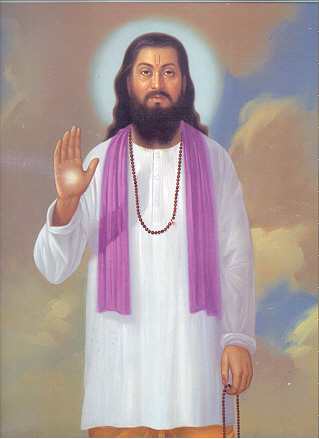 Shri Guru Ravidass Ji Maharaj took up the occupation of leather worker, or Chamar, as He was born into it. However this was not a barrier for Him, as He rose to break the shackles of oppression through his Divine Acts. The Pandits of His time may have been versed in the Vedas and Shastras but their knowledge remained theoretical, not based in any concrete experience of the Divine Bliss. As such they were not able to repeat any of the Divine Deeds shown by Shri Guru Ravidass Ji Maharaj on many occasions. It is not our intention to offend anyone, especially through any lack of knowledge.